We open our homes and our hearts during Holiday season and it is only natural to make your abode look its best. Every year brings new decor ideas, trends, preferred colors, but one theme stays beloved by all: Rustic Christmas Decor. Maybe, it is nostalgia for those simple days spent in grandparents’ cabin in the woods or longing for natural beauty and warmth of wood, intriguing textures of knitted wool, little pleasures of imperfect nature finds – we all agree that rustic decor feels right in our homes at Christmas. As rustic farmhouse decor is neutral in its nature, it is easy to brighten it up with traditional reds for Christmas or keep it clean and simple for urban shabby chic of black and white. Either you are a minimalist or like to go all out for the holidays, you would enjoy our collection of inspiring ideas from crafters, designers, bloggers, and social media enthusiasts to help you fill your holidays with joy. 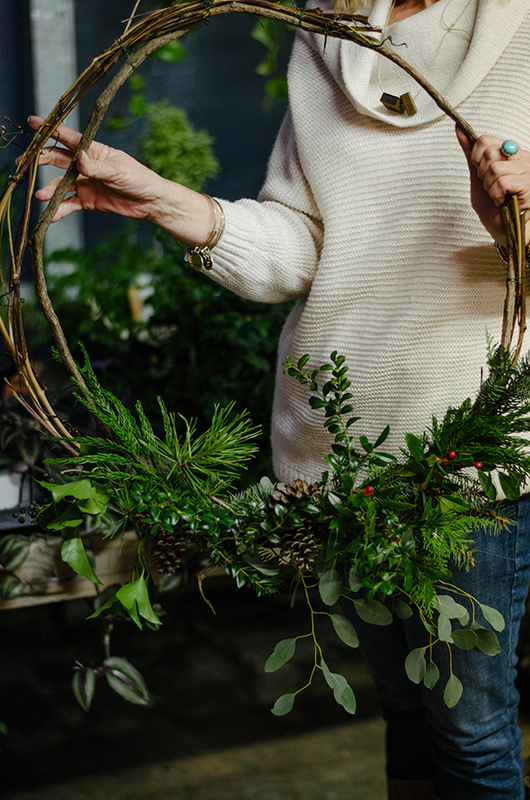 This oversized grapevine wreath adorned with fresh pine and cypress greenery, pine cones, and berries will be easy to recreate with evergreen cuttings from your garden or findings at the local farmers market. 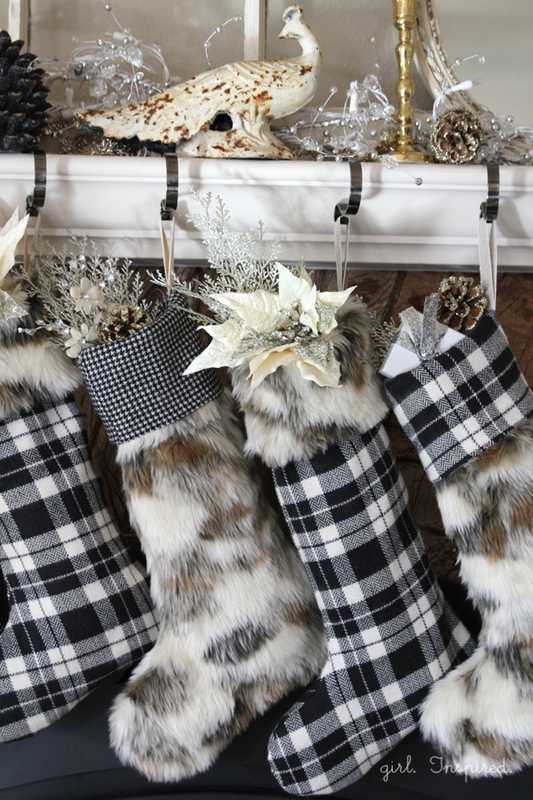 Fabulous meets fun in this shabby chick DIY Christmas stockings. The step-by-step tutorial makes it easy to create your own Christmas stockings for the whole family. 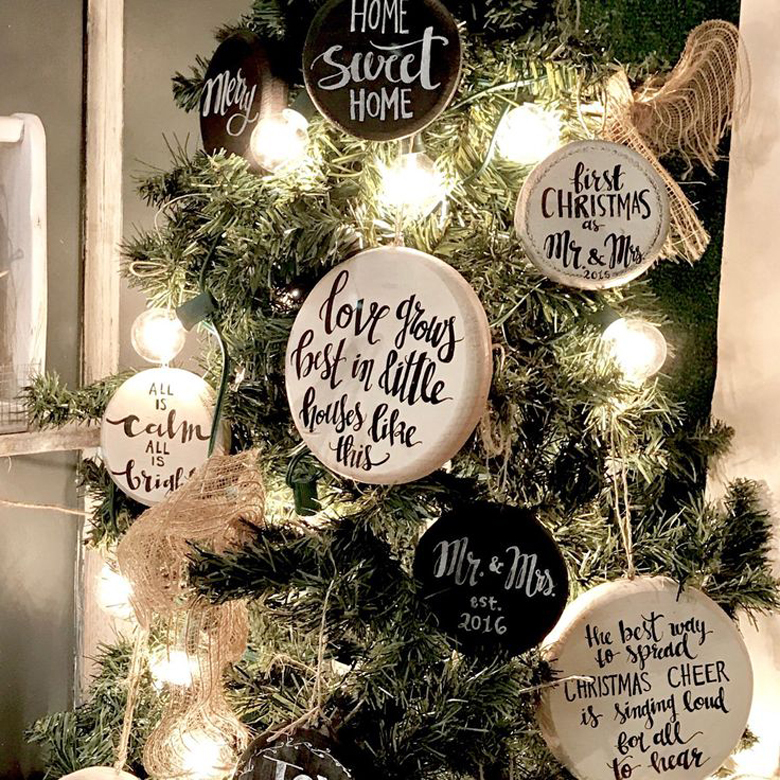 Professional designers agree that these rustic Christmas ornaments are among timeless trends that will be popular as farmhouse Christmas decor for years to come. Use your favorite quotes in little frames or print and glue them on simple wooden circles. Burlap ribbon and big lights add charm to this rustic Christmas tree. Let it ‘snow’ metal vintage letters create a nostalgic feeling in this open shelves display. 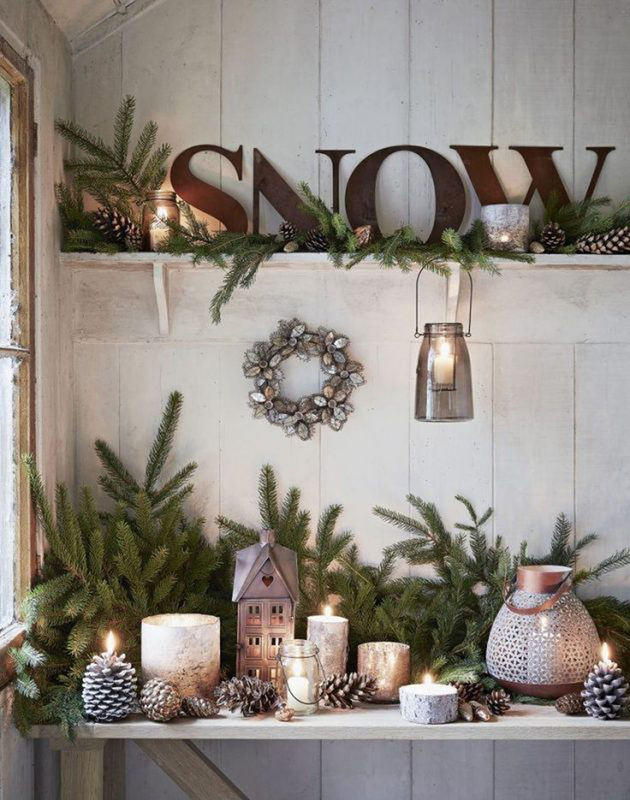 Dust-off some old Christmas decor or add a few finds from Antique shops and with fresh greenery, pine cones, and candles you’ll create a magical yet warm and simple Holiday decor for your house. Do you have some old wooden boards to upcycle and give them a new life? Add a simple Christmas tree design with a white paint or washi tape and a little touch of twine for rustic farmhouse mantel decor. No time to make your own? Check out this fabulous Etsy shop to order online. 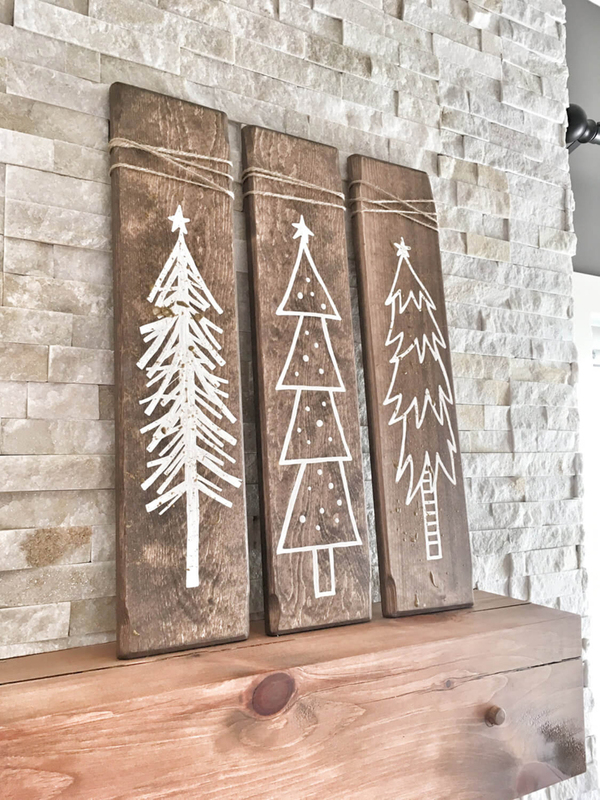 Rustic Wood board trio Christmas Trees Sign – one of the easiest and fun DIY rustic Christmas ornaments you can do with your family this holiday season! 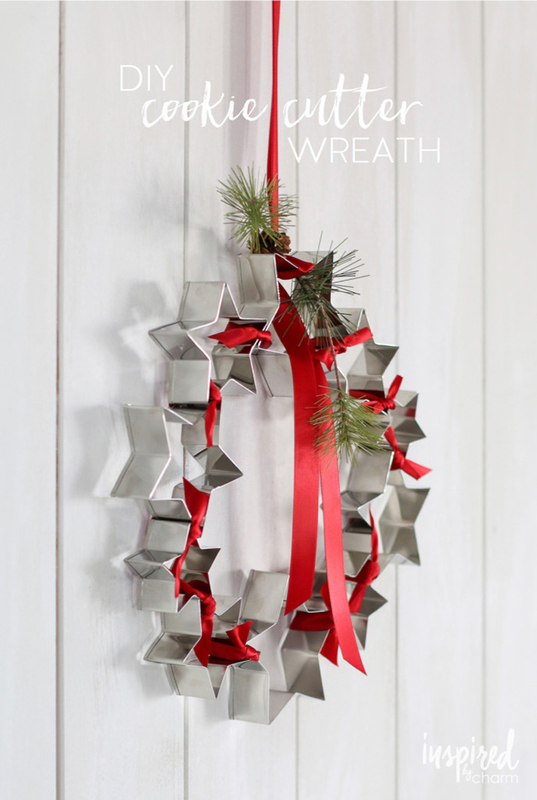 Easy-to-make cookie cutter wreath will be fun to make with the kids after Christmas cookies are baked: all you need are cookie cutters and some red ribbon. Use mismatched antique cookie cutters to create more rustic decor. Many people like this dual-purpose ornament – it can be used for Christmas decoration and making actual cookies. What makes this headboard so fabulous? 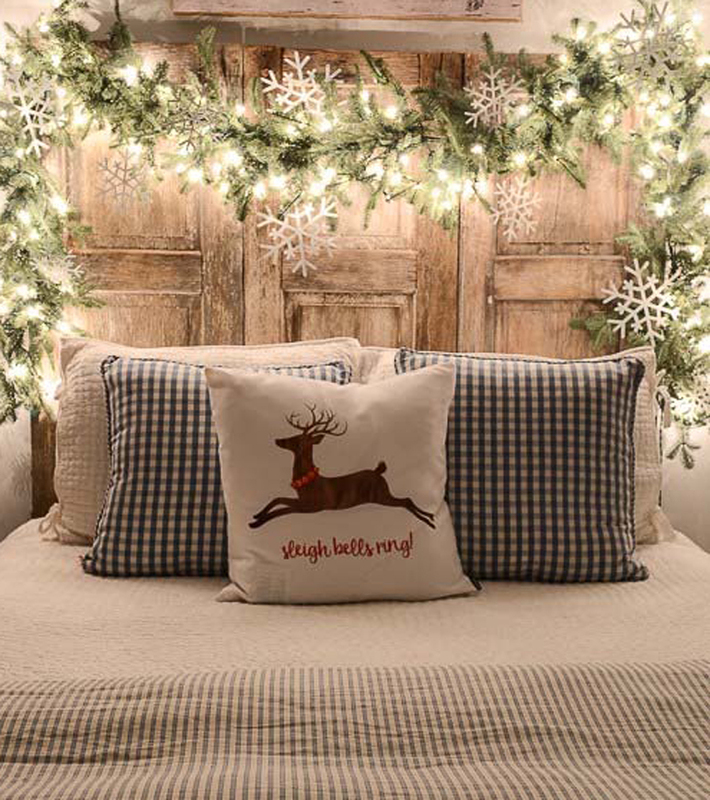 The warmth of old wood, simple garland with lights and snowflakes, and nostalgia-evoking pillows bring this whole look together. It makes a wonderful addition to any guest room in the house – just in time for the Holidays. 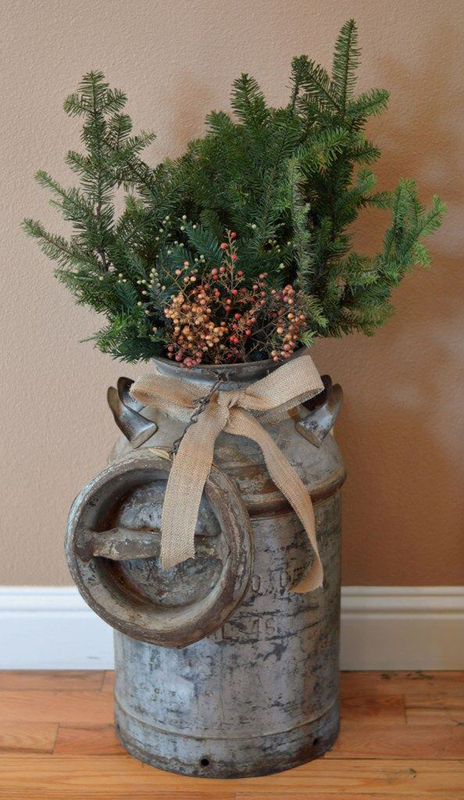 What a simple idea – just arrange seasonal greens and berry branches to breath a new life into an old rustic metal milk can. Simple burlap ribbon adds a finishing touch. 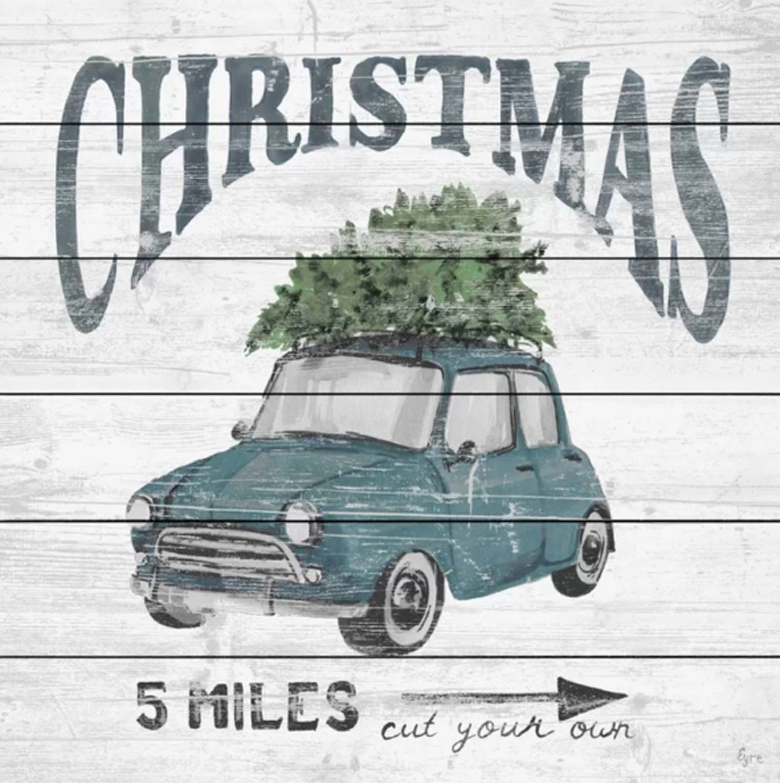 The nostalgia of olden days when families spent time together to cut a tree for the Holidays – it is a great sign to remember family traditions and create new ones. 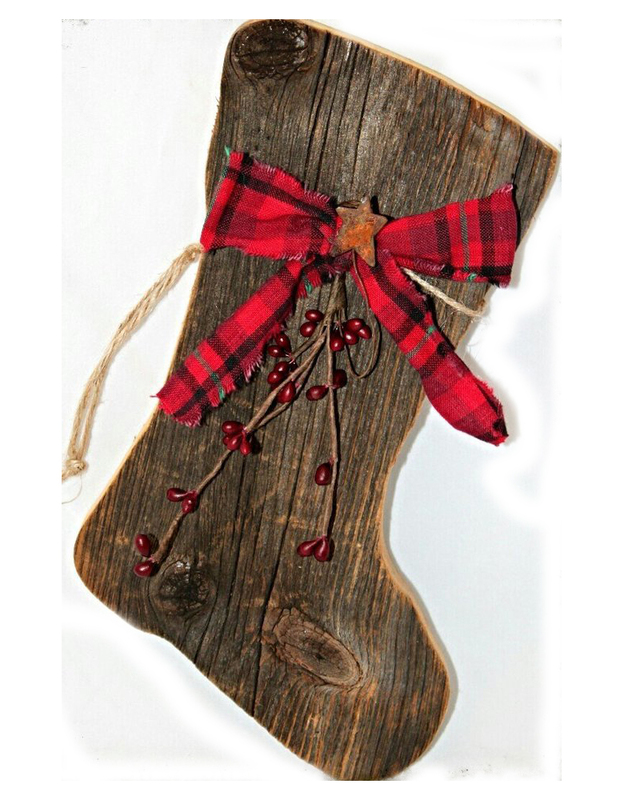 The beauty of old wood, rustic metal star, flannel bow, and simple red berries – this barn wood stocking is a great addition to your farmhouse decor. ‘Let it snow’ sign with simple white lettering and snowflakes make a great indoor or outdoor decoration piece to warm up your home for a family gathering. 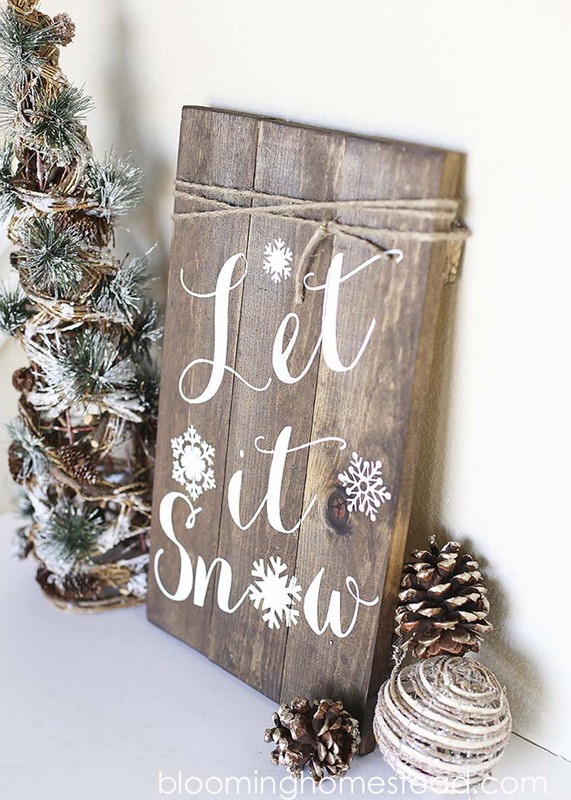 Large Wooden Let It Snow Sign can be a terrific addition to your other traditional rustic Christmas ornaments! 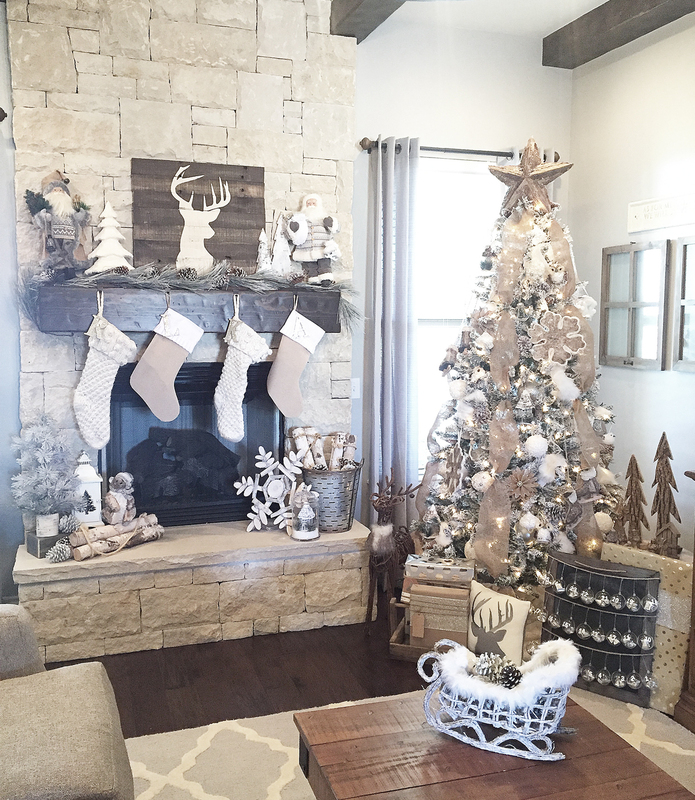 Our team loved this fabulous rustic farmhouse display: warm colors, stone, wood, burlap, and tasteful white accents along with vintage Christmas ornaments and decorations create a wonderful feeling of joyful celebration. 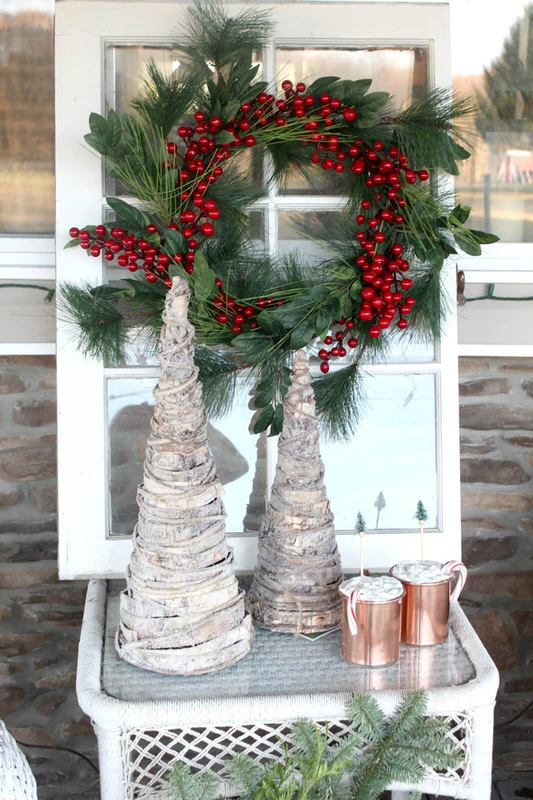 This little porch decor is so simple yet tastefully done: imperfect old window, simple green wreath, birch bark trees, and.of course, hot chocolate. 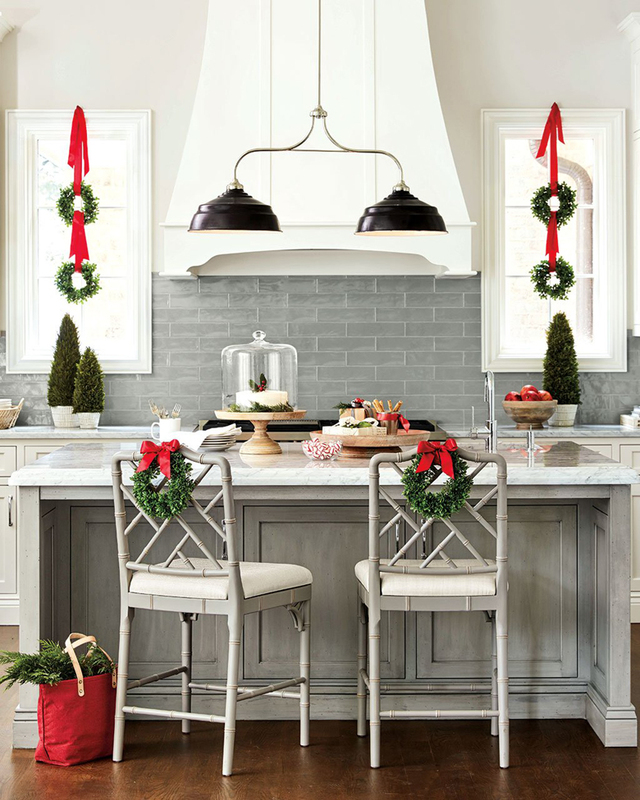 Take advice from expert designers for a magical Holiday season: if you already have a modern farmhouse kitchen, just add a few green wreaths connected with a red ribbon for quick and easy Holiday decor. Modern Farmhouse Christmas Kitchen Decor can be elegant and minimal at the same time. Is it time to give your mudroom a makeover for the Holidays? 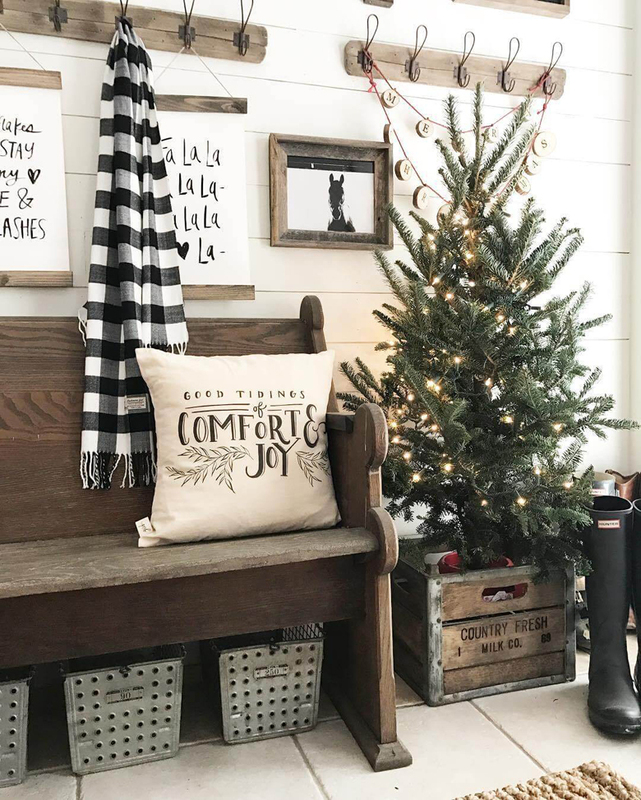 Simple vintage pillowcase, wooden create to support a fresh-cut Christmas tree, a few printables, and metal containers to organize all the stuff will do the trick. This cheerful mantel display will work even in the urban setting: we love the simplicity (and the message!) 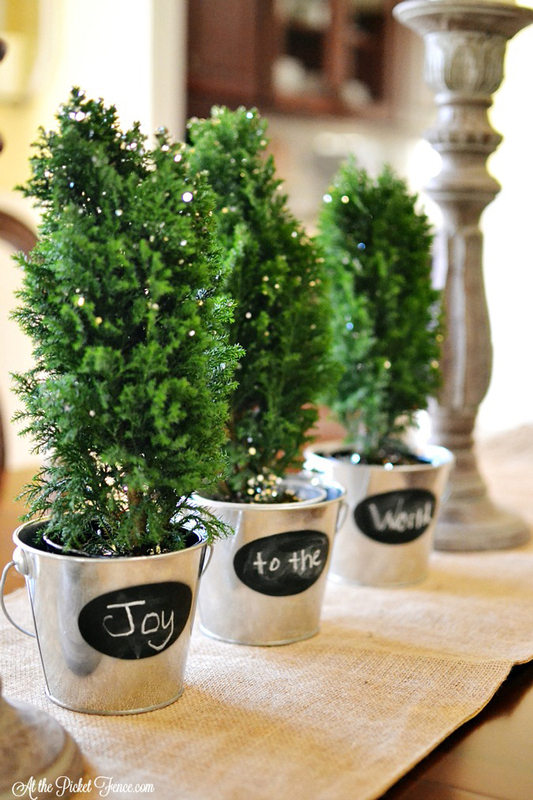 of chalkboard sign, metal containers to hold the greenery, plaid and white stockings adorned with faux fur, and a Christmas countdown calendar. 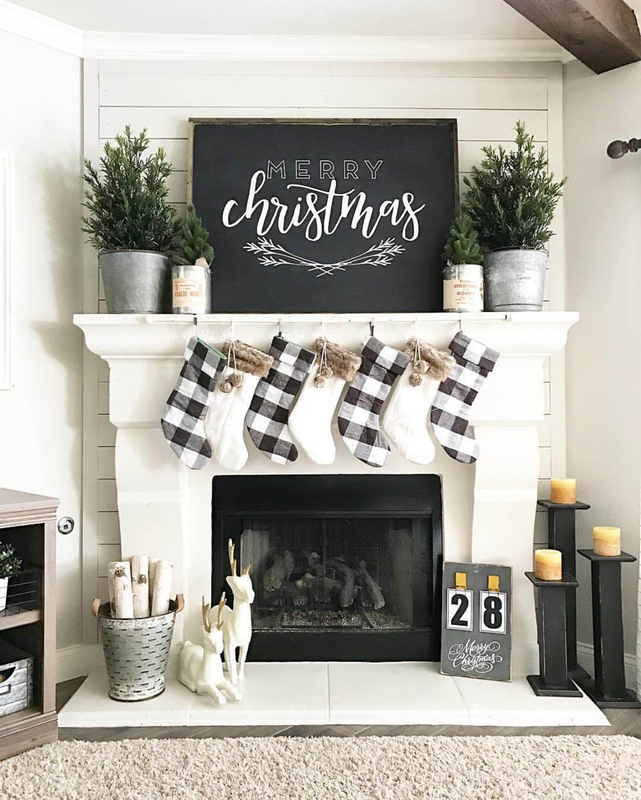 Don’t you agree that using plaid and white stockings as rustic Christmas ornaments is always a good idea for rustic Christmas decor – lovely! What a bright idea! You have probably seen these trees for sale in almost every store around the Holidays. Just add a personal touch with chalkboard stickers and your own message for a super-simple decor idea or a sparkling dinner table centerpiece. 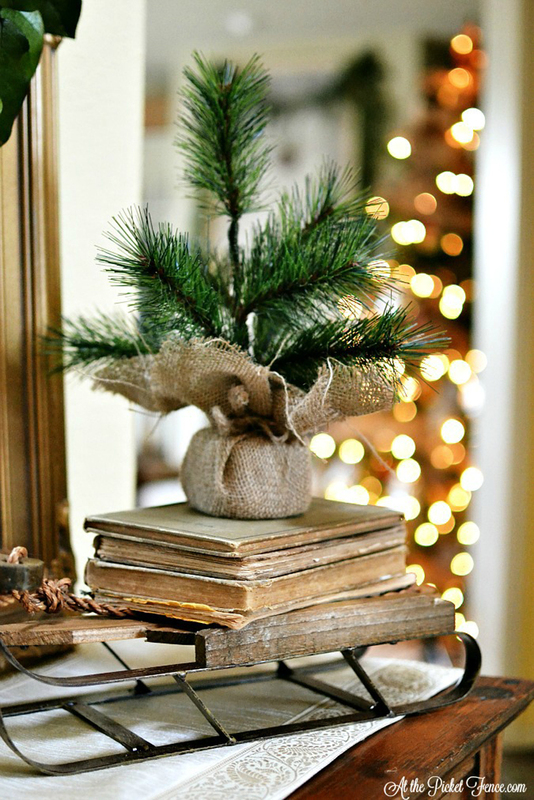 It is time to cherish the sweet memories with family heirlooms: put them on display this Holiday season along with pine trees seedlings wrapped in burlap to recreate a magic of family Christmas. When spring comes, it would be so fun to make a new tradition: plant a tree and watch it grow. 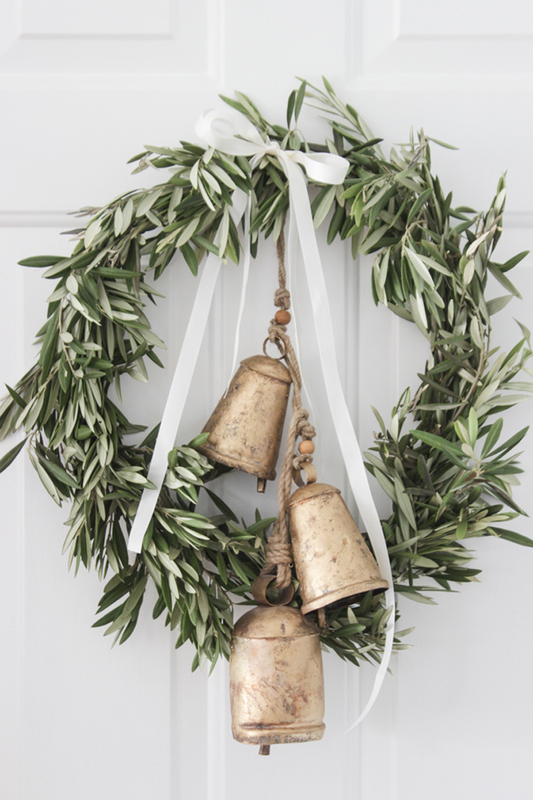 This is the easiest wreath to create for the Holidays: a few olive branches and antique cow bells will look so festive indoors or outdoors to welcome family and friends. 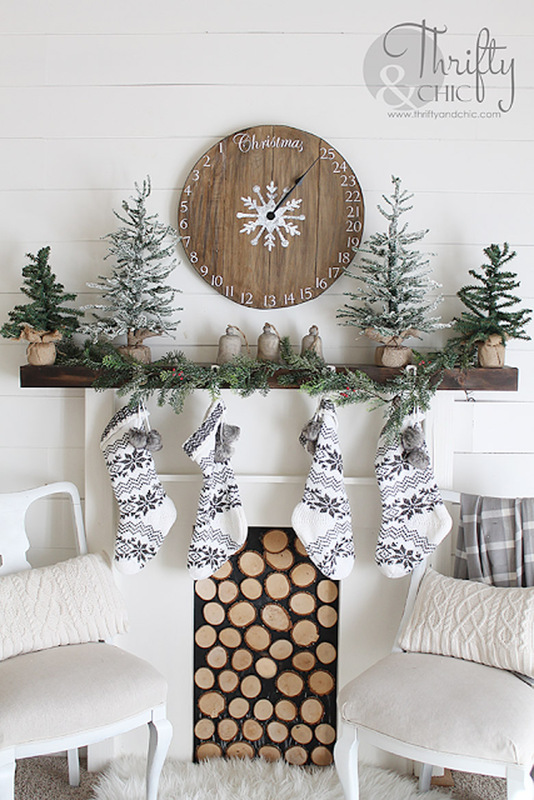 Such a brilliant idea: wooden count-down-to-Christmas calendar (with step-by-step tutorial) is easy to make and will be a great addition to any rustic farmhouse mantel decor. Black and white stockings, antique bells, and little trees wrapped in burlap complete this tasteful display.